Surely I can’t be the only one that after wearing sandals throughout summer their feet start to look, well less than appealing? Sorry to say but wearing bare feet with shoes seems to leave me with dry skin on my feet, blisters and just general unhappy feet. So when Scholl sent me a box of goodies this week for my feet I decided it really was time I did something with them and with my pamper package in hand, I set off to try to rectify the situation. I am a big fan already of Scholl’s Express Pedi and have introduced it to all my friends and family, who now have one too. Scholl kindly sent me some new heads for it, the Velvet Smooth heads with diamond crystals. I hadn’t tried these yet so was looking forward to seeing what the difference was from the original. These heads have finally ground diamond crystals so work harder on stubborn skin. The express pedi works so quickly on any hard skin, you just switch it on and it gets to work straight away. I have never found anything better than this, a foot file does work but just not like this and this leaves my feet feeling pretty new again. This is my favourite part. 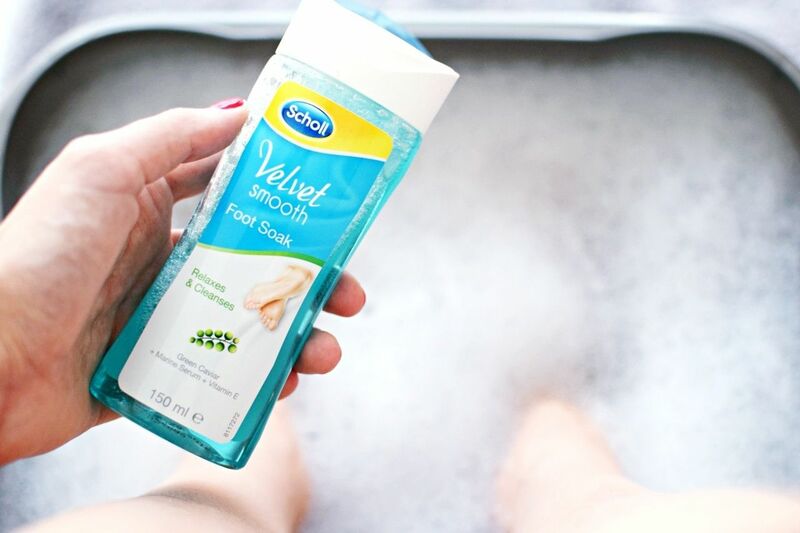 For this I filled up a basin of hot water and mixed in the Scholl Velvet Smooth Foot Soak. The foot soak relaxes and cleanses and has green caviar, marine serum and vitamin E in it. I soak for 15 minutes and it feels so lovely. Afterwards my feet were feeling very soft and ready for the next step. Trim your toenails with nail clippers or nail scissors, whichever you feel more comfortable with. Trim them down and leave a bit of white, as too short can leave you with ingrown toenails. With cuticles, you can either clip them with cuticle scissors or like me I just push them back with a wooden stick. You can get some great cuticle softening gels if you struggle with this part. Either moisturise your feet using your usual body moisturiser or I opted for Scholl’s Intense Caviar Serum. The serum is packed with hylarounic acid so moisturises your feet so well if they are really dry. It also has Green Caviar and Pentavitin in it too which also help to hydrate the skin. I feel like I never look after my feet so even by applying this I feel like I’m giving them a bit of tender loving care. If I’m not painting my toes I like to sleep with my feet in socks after applying this for super soft feet in the morning. If painting avoid the toes so they are nice and clean for polish. Now the feet are looking clean and refreshed, I like to paint them a bright colour. I used Little Ondine’s polish in Love Letter. This polish is slightly different to the usual as you can peel it off when you get bored with it and want to repaint. For me this is awesome as I am so lazy when it comes to doing anything with my feet never mind painting my toenails, so the ease of peeling it off is brilliant. The polishes themselves are odourless, quick drying and you don’t need to faff about with base coats and top coats, just a couple of coats of the colour and they look great and shiny too. The best thing about them is they are organic and made up of natural resin, organic colourants and water so don’t worry about ruining your nails. Check out their full range of colours on www.uk.littleondine.com.